Click picture below to find out what we have done in these topics. exposure to temperature changes and moisture. allows them to be sanded and patched as needed. with your choice of veneers. solid wood plank currently available. panel without the excess weight. to make the same products. This is your Stile and Rail after the veneer has been pressed on. are still incredibly strong and lightweight. Drill holes to insert dowels. Router out the end if hardware is to be installed. Here is the stile and rail door stained and ready for glass installation. This custom made trapezoid door traveled over 2,921 miles from coast to coast, now on final leg of its journey to its new home in upscale Manhattan apartment. customer's needs, we offer the best guarantee in the door business. What Services Does Singcore Provide? Prototype - In addition to ordering our standard panels, you can upgrade* to our Sing Core R&D Services, take your idea, we build it and you use it to make money. We will consult with you and let you know if your concept piece is compatible with our Sing Core products. You design, We produce - Already know what you want made for your office/business? Fill out our quote request form and we’ll contact you within 24 hours with your quote. OEM Replacement Parts - If you need to replace an old item like a door you might as well upgrade it to a Sing Honeycomb Door. Design to Market - From prototype to our standard panels, we can manufacture by the truckload for additional savings. "No job is too big, No job is too small"
In-house Services: Sing Core can manufacture your panels at our Washington state facility with all of your requested blocking, core sizes, solid wood edging and skins, then you do the finish work such as trims, paints/stains, installing locks/windows etc...most economical when ordering less than a truck load. Use one of our "Domestic Alliance" companies: to do your finish work on your product adding locks, trims, windows, paint/stains etc...this service will incur additional cost that you will pay directly to the company providing the service but saves you from having to do the work. Overseas Manufacturing: We can have your product manufactured in truckload bulk, overseas which will provide you with additional cost savings instead of having your products made here state-side. Your product will be made according to our technology and quality assurance standards, except product will need to be ordered in bulk by the truckload. Draft rendition of our Honeycomb Door Core and Glass Insert. Our door cores fill a need in the sliding glass door niche because our cores are not only lighter than standard solid wood, fiberglass and composite door cores but our cores are stronger providing a longer lasting door core with a structural guarantee of 10 years which is about 9 years longer than the standard guarantee out there because of our torsion box technology with provides the strength and stability that all doors should have but don't unless they're our doors. Door size, Window size doesn't matter, our cores can do them all! choose your surface. It's great to get choices. This gigantic panel is actually going to be a shelving unit. covered in 20 gauge galvanized steel skin. be used for your own honeycomb panels. Inventor Peter Sing is standing on panel 118" x 35" x 1.072"
and covered in 20 gauge galvanized steel skin. Our panels are so lightweight and strong we'll not only stand behind their strength and quality but we'll stand on them! lightweight but strong and lasting. Our patented Sing panels are an all in one concept, you can use them for your walls, roof and flooring. Our panels don't require any additional siding, studs, insulation, vapor barrier or even additional interior walls. This saves you precious living space and weight and our panels are just as strong without having to be built using conventional framing methods. need to be strong, light and dimensionally stable. Sing Honeycomb Panels in an industrial sliding door application. Here's How Strong, How Light, How Flat our Honeycomb Panels Really Are! and with the same dimensions would require double the number of people carrying it. panels will affect moisture absorption. For more in-depth information about our panels click here. Check out the new doors for one of the world's largest distributors of mint oil! We were really happy to build two sets of large oversize doors for an essential oil warehouse recently. One pair of panels became the double door set opens to the sides (left), while the other set of three rolls off to the same side (right). It's the Cadillac of custom sliding doors. Spring is the time for cleaning and growing. We are revising our newest website, creating new marketing strategies, and developing new products. Our office staff has grown to include five members, and we plan to continue growing both in the office and in outside sales representatives. 1 We are combining our previous websites to make your web visit more user friendly. Our main web site is now http://www.singcore.com/. For the mean time, our old web sites also work. 2. We now have our online store through Big Commerce. You can order furniture and small items without going through PayPal. Check it out! Purchase your first pair of Sing Carriage House door panels at $256 apiece. The least expensive steel roll up door retails for about $1,000, whereas a solid wood carriage house door retails for $5,000 or more. 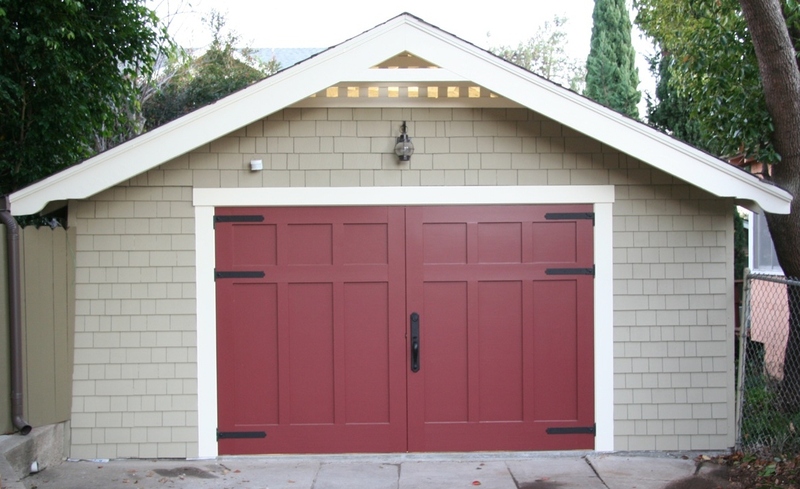 Homeowners may enjoy the beauty of a carriage door for the low price of a steel door. Email sales at singcore.com for a quote. We also offer a garage organizer to help tidy up your garage. We are happy and proud to introduce Celina & Walter Dill as members of our Sing Tiny House family...click here for the continuing adventures of Celina and her dad Walter as they build their dream Sing Tiny House. The sizes are 1 panel is 98" x 62" x 2 1/2"
The other 2 panels were 104" x 190" x 2 1/2"
You can see how straight and flat these door panels are. easy they are to open and close please click here! using our Sing Folding Table...for more pictures, click here! put together. Stay tuned for more pictures as our customer continues. average carriage doors being made and for less money. In today's housing market a Sing Log Home is better than "money in the bank"
his "tiny house" project, for more pics about these doors "click here"
You can also see our customer's blog "click here"
The cedar veneer doors are exactly what we were looking for. Thank you so much Linda and Sing Honeycomb Products. A big thanks goes to the guys in the shop who make the doors. The custom size measurements were exactly what I specified. The aromatic cedar veneer is beautiful with lots of variations in the knots and colorful grain patterns. They made a nice room into a "wow" room. The aroma is still pleasant after four weeks. Attached are two photos from the project. Thanks again for your specialty door products. Sing Honeycomb Door Cores put to work in California! Here are our doors getting set up just need the finishing touches to be ready. These huge sliding doors/moveable wall system uses a much lighter door hanging equipment than our competitors, helps you spend less on equipment, also because our sliding doors are lighter, they are easier to open/close which reduces the chance of employee injuries. Here are our doors in their finished stage being used in a tough environment, but our doors will last for years to come. The Sing Honeycomb "Quik" Table has been tested for strength and rigidity, and we're proud to say the sing honeycomb design lives up to all expectations. A 250 pound load was distributed on the top of the table legs, still did not even bend. By the way did we say it only weighs 26 lbs! Carry your table outside for a picnic, (oops! did you say you live in Washington or Oregon?) starts to rain, no problem you can take the table in as one piece or in less than a minute you can take it apart and take it inside to eat in dry comfort. See additional updates about our Port Orford flooring click here! Beautiful Sing Honeycomb wood floor project: completed! styled flooring made with our patented Sing Honeycomb core panels are as different as night and day. The Sapele flooring in the red tones is made using our Wide Plank Flooring 9" x 10" plank method, while the Port Orford flooring was manufactured as a solid sheet flooring 4' x 8', but they are the same because of the torsion box/sandwich box design and their honeycomb cores. Strong, lightweight, insulated flooring. Easier to install than linoleum, stronger than regular hardwood flooring. The best of both worlds. This new Sing wood floor is made with patented Sing honeycomb sandwich torsion box panels, like the bench below, these flooring panels are super strong, light weight, ultra insulating, and beautiful to look at in your home. Lightweight Shoe/Entry Bench: For only 16 lbs this heavy duty bench made with patented Sing honeycomb sandwich torsion box panels will hold 400 lbs without any staggering or bending and still light as a feather. It is completely modular and can be stacked for other applications, such as shelving, step stools. Sing Honeycomb Products is proud to introduce our newest product line, our nesting step benches. Lighter and safer than standard step-stools. Our 3 nesting step-benches are extremely light-weight and you can use them without the worry of falling off them like on a step-ladder. our wide steps allow the entire foot to be used instead of just the ball of the foot like on step-stools or step-ladders. Our 3 nesting step-benches can provide you the height you need to reach any cabinet in your house or provide you with comfortable counter-top access in your kitchen for all of your cooking, dish-washing needs. Sing Honeycomb Products not only make moveable walls, large customer doors, we also can make overhead garage door panels, still using our torsion box manufacturing Sing Honeycomb products that ensures that your overhead, carriage and the traditional tilt-up garage door. We can provide any size, style or type of panel that can then be customized to your specific style. Here is the flooring panel from below now installed in its new home. This makes for a lightweight dimensionally stable product that can become an insulated butcher block floor or table. It could also be a large carriage door, sliding door, pocket door, work bench, kitchen counter-top, wall, ceiling panel. Sapele Flooring stands 9"w x 8' & 10' long 3 planks placed together = 27" x 120" x 1 1/2"
Not just any kind of flooring but the wood veneer we use in our flooring is the same kind used by the Cadillac car maker for the CTS. Our flooring is made based on a torsion box style of manufacturing to ensure our customers will have a strong, lightweight and straight floor that will last for years and years. The added bonus is that our flooring is also an insulated flooring so noise is reduced and thermal transfer is less, but it's not just a treasure of engineering it's beautiful too. made for Seattle's "Urban Enoteca"
Sing Honeycomb Core. The best Big Door Core Material Made in the USA. We are the best custom door core manufacturer on the West Coast who ships world wide. honeycomb press, made of sandwich honeycomb panels and beams. combined with Sing Honeycomb Core as the core material, for a customer in Michigan: dimensions were 84" wide x 162" long x 3 1/2" thick, weight is approximately 320 lbs which is extremely light considering it size. weight of any other vacuum table manufactured in the USA. This entertainment stand is lightweight, knock down collapsible, easy to move or transport and made with natural cedar from the Northwest. Easy to transport and strong--load capacity over 500 lbs. You can have your entertainment stand delivered collapsed or assembled. No Particleboard or MDF used in any of our products! We guarantee our butcher block is the best in the world otherwise we will pay the return shipment. 1. Patented Sing honeycomb cutting board. Does not warp or crack. It stays true and flat with counter top to avoid vibration The flat surface also eliminates the noise of chopping, because it does not bounce on the counter top. 2. Lightweight for easy move around and cleaning. 3. Dishwasher safe and easy to clean just as easy dishes. 4. Eco-Friendly. Patented Sing honeycomb take less energy to create than similar heavy butcher blocks, which can crack and warp if not oiled frequently. Even solid wood end grain will crack after time. 5. We provide a resurfacing service after years of usage for less than half of the purchase price. 6. Free shipping if you purchase four or more cutting boards. Our cutting boards are designed for top of the line chefs. Our newest line is compact in size but not quality, use our 20"
heavy duty and we use all real wood in our drawers never press wood. panels to build your own. Our 4'x8'1" signboard weighs only 16 lbs. Wow! blackboard paint and you have a changeable advertising board for your daily specials. Cover with grooved letter board and make your own changeable sign with moveable letters and number. Panel weighs in at just 42 lbs but holds up to a 1,000 lbs of weight! Note how straight and strong the panel is even with all of that weight there is no bending or bowing of panel, that is strong! A Singhome do-it-yourself table with an easy to assemble joint. An insulated Sing home shed after several years without any form of maintenance still shows structural integrity. Most dimensionally insulated precision log in the world . Look no further Sing Home is the easiest way to build an energy efficient home.